Prostate cancer (PCa) is the most common cancer in men in the United States . In the past decade, the incidence of PCa continues to increase and has become the second leading cause of cancer death in men in the United States . Clinically, more than 80% of men with aggressive (AG) PCa will develop skeletal complications which cause a dramatic reduction in quality of life . Currently, Gleason score which is based on the architecture of prostate tissue is used to diagnose AG PCa [4, 5]. Cancers with lower Gleason scores (< 7) tend to be less aggressive, while cancers with higher Gleason scores (7 or above) tend to be more aggressive . Gleason score 7 are reported as being either Gleason score 3 + 4 (with Gleason pattern 3 being more predominant with some Gleason pattern 4) or Gleason score 4 + 3 (with more predominant Gleason pattern 4 and some Gleason pattern 3). Most recent studies have shown that Gleason score 4 + 3 cancers tend to represent more severe disease, with higher risk of biochemical recurrence compared to Gleason scores 3 + 4 disease [7–9]. 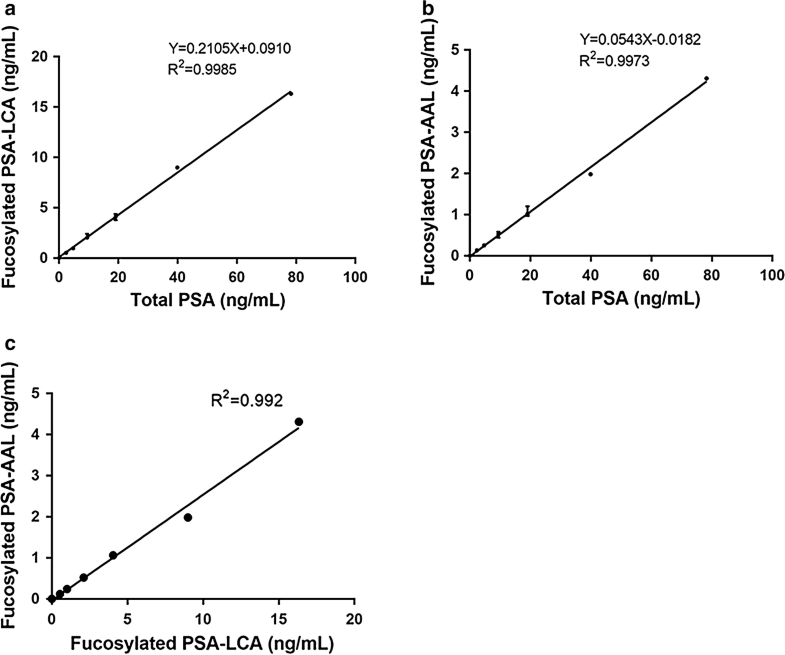 Prostate specific antigen (PSA) is a commonly used serum biomarker for early detection of PCa [10–12]. With the widespread introduction of PSA testing, more prostate cancers were discovered at early stages [13, 14]. However, PSA testing has limitations such as low specificity, false positive results and over-diagnosis [15, 16]. Some benign prostate diseases, especially benign prostatic hyperplasia (BPH) and inflammation of the prostate can also cause significant increases in serum PSA levels [17, 18]. 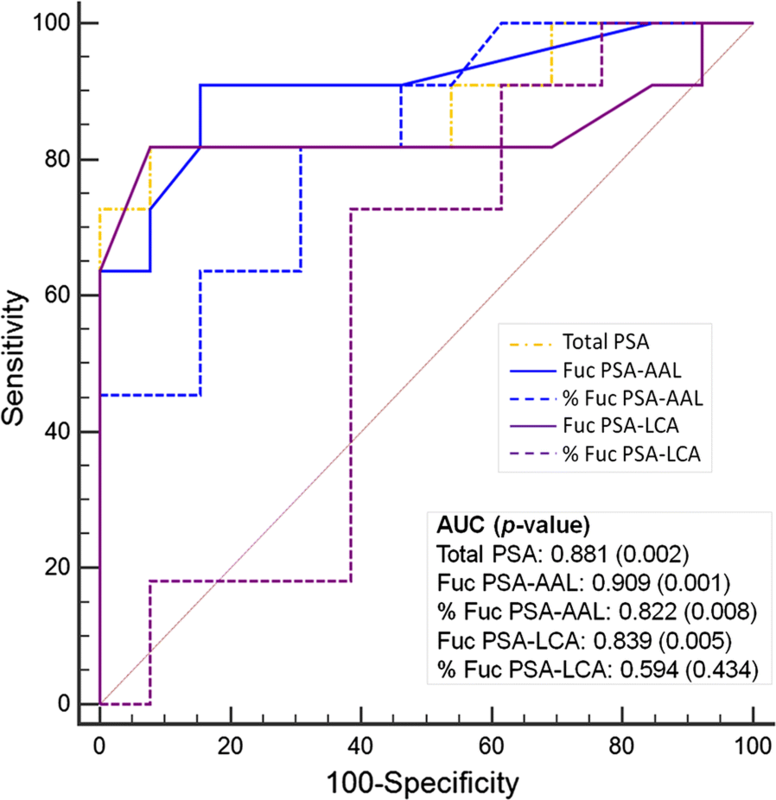 In addition, PSA is less effective in distinguishing AG from non-aggressive (NAG) PCa and other benign prostatic diseases [19, 20]. Therefore, there is a need for biomarkers that can distinguish AG from the NAG PCa phenotypes and other benign conditions. Glycosylation is one of the common protein modifications . Several studies have shown aberrant glycosylation especially fucosylation (Fuc) in tumor biology [22–25]. 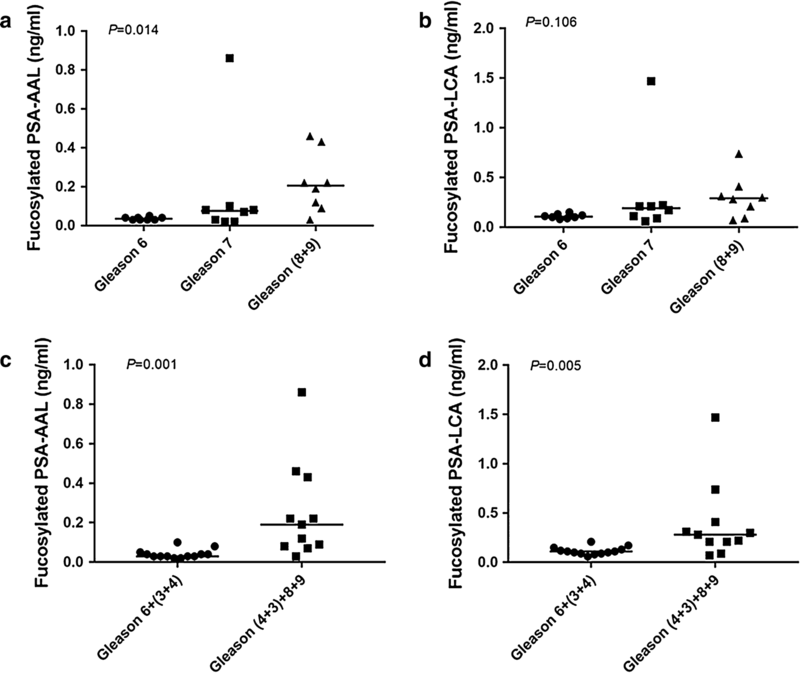 For example, the fucosylated glycoform of α feto-protein (AFP-L3) gained the approval by the Food and drug administration (FDA) as a biomarker for the risk of developing hepatocellular carcinomas . Aberrant Fuc is caused by alternations in glycosylation-related enzymes such as fucosyl-transferases (FUTs) and fucosidase [27, 28].